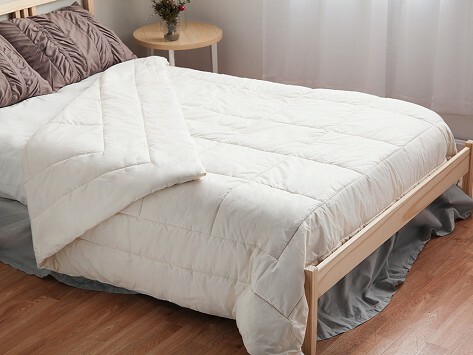 Take your sleep to the next level of comfort with an all-natural wool and cotton comforter. The breathable wool fill helps regulate your temperature, so it can be used year-round. It’s also hypoallergenic, anti-microbial, and washable—not to mention plush and soft. Dimensions: Twin: 66" x 86"; Full/Queen: 86" x 86"; King: 100" x 86"
Weight: Twin: 8 lbs. ; Full/Queen: 9 lbs. ; King: 11 lbs. This comforter has weight without being heavy. It may downs crazy but the quality it fantastic. I love myComforter! Absolutely amazing! I got this comforter after researching all of the different types of duvets out there, thinking I would love to get my first down comforter, but after reading up on this as a natural alternative, wool came out ahead by a long long way.